The Deluxe Scheduling: Gold Polka Dot pocket chart measures 13” x 36” and features 12 clear pockets (12” x 1”) 1 storage pocket (12” x 4”) and 15 write-on/wipe-away cards (12" x 2.25”). Accented with metallic gold polka dots this scheduling pocket chart for the classroom provides the perfect way to display your daily schedule and to reinforce time-telling concepts. 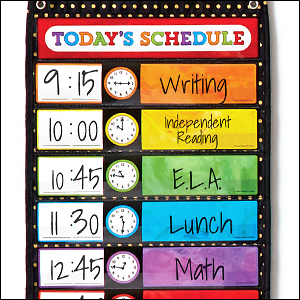 Durable and flame-retardant Carson-Dellosa’s screen-printed scheduling pocket charts for the classroom help teachers stay on schedule while reinforcing essential skills. This black and gold scheduling pocket chart is a perfect fit for every classroom. This pocket chart measures 13” x 36” and features 12 clear pockets (12” x 1”) 1 storage pocket (12” x 4”) and 15 write-on/wipe-away cards (12" x 2.25”). 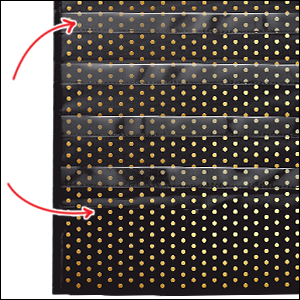 Durable and flame-retardant the Deluxe Scheduling: Gold Polka Dot pocket chart provides the perfect way to display your daily schedule and to reinforce time-telling concepts.